Agnieszka is a film school student whose final film centers on Mateusz Birkut, a bricklayer from Nowa Huta, who was considered a great hero and a leader at work. Later - like many others - he was fired without any pity. In examining the truth about his life, Agnieszka discovers a more general truth about the bitter years of the 50s and about the difficult fate of the Polish nation. Language: Polish, with English subtitles Director: Andrzej Wajda Release Date: 1976 Run Time: 153 min. 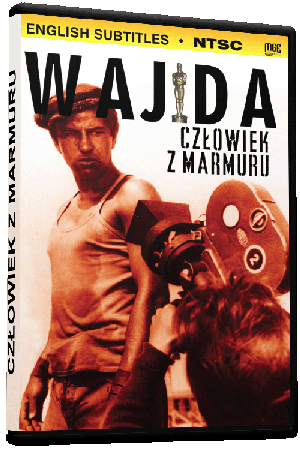 A film about making a film, September 9, 2003 "Czlowiek z Marmuru," directed by Andrezej Wajda, is a story about a student making a film about a bricklayer that was idolized in the 1950s, and then denounced. She uncovers more and more details of what happened to him by interviewing people that knew him (that tell her their story) and viewing film clippings about him (which are shown in black-and-white). Between tracking down details in the present time (1976), watching black-and-white newsreels from the 1950s, and the stories various people tell (flashbacks), the film is a captivating mystery that unfolds, while holding your attention. "Czlowiek z Marmuru" (1976) is 156 minutes, spoken in Polish, and has optional English subtitles.